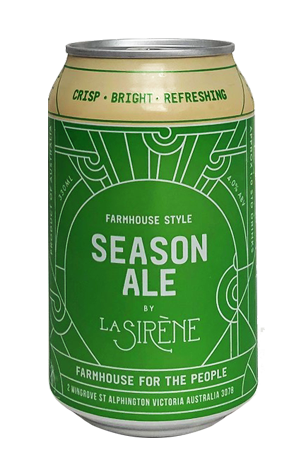 For their third can release, Season Ale, Melbourne-based urban farmhouse brewery La Sirène have arguably opted for a more traditional approach than with the beer's predecessors. While Urban Pale saw Costa Nikias and his team bring a heap of hops to the hazy farmhouse party and, in Citray Sour, combine the juiciest of fresh oranges with a delightfully refreshing acidity, here you've got something more akin to the saisons upon which the brewery first made its name. You'll pick up some of the characteristics delivered with more potency in the brewery's core Saison, just dialled down to one-standard-drink-per-gorgeous-green-can levels. There are soft lime curd, melon and passionfruit aromas and elements of both creaminess and crispness on the palate, while, at four percent ABV, there's a delicacy at play, aided by a drying, lightly spicy finish.